What is the difference between branding and marketing? What are the challenges of branding and marketing a cluster? How to cut through the noise and catch the attention of your target groups in an increasingly saturated communications environment? These are some of the questions discussed in the training workshop held in May in Barcelona by Future Place Leadership. 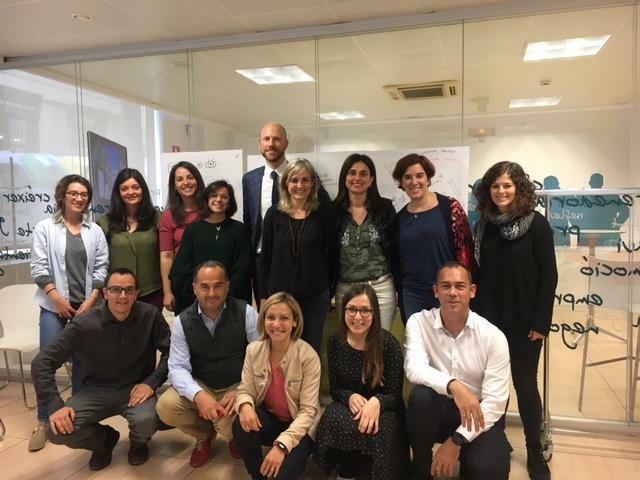 The participants were cluster and communication managers of the cluster organisations that are part of the Catalonia Clusters programme. Coordinated by ACCIÓ, the Catalan Agency for Business Competitiveness, it is one of the longest running cluster programmes in the world. ACCIÓ regularly organises trainings for their cluster organisations. The discussions were very fruitful and dynamic, reflecting the very high level of development and maturity of the Catalan clusters. Branding as a concept is often seen as only being about communication, which is a misconception. Essentially an organisation, a place or a cluster can build a brand without any communication whatsoever. Nurturing a strong identity and creating relevant, high-quality products, services or experiences can build a positive and unique brand. That said, marketing communication can speed up the brand development. In the cluster context, branding is both about marketing and developing the cluster – you need to practice what you preach, so to say. For example, if you want sustainability to be part of your desired cluster brand image, you need to make sure that the suitability is a core focus in everything you do, as well as in what the individual cluster actors do, because they are the ones that chiefly will build the brand. Needless to say, this is easier said than done. Marketing is a complementary activity to branding and is about how you more effectively can sell the products, services and experiences created by cluster actors. To build a brand that is perceived externally, you need to create a strong sense of identity internally. A key challenge for clusters in this regard is the low level of identification among cluster actors. Here, contemporary place branding practice and theory can be of help, devising a participatory approach to brand creation. The best way to encourage stakeholder participation is simply to include stakeholders in co-creating and co-deciding on the brand strategy. Finding the raison d'être of the cluster is also a good starting point for branding: There is a reason why a cluster is a cluster and cluster branding is very much about finding that reason. It is increasingly challenging for any actor – be it a consumer brand, government or cluster organisation, to reach its target groups. Explanations abound – the market is saturated and so are the airwaves and Internet; people are more demanding and knowledgeable about their needs and they increasingly become sceptical of one-way, paid media communication. More and more actors are also prioritising communication activities to promote their interests – including celebrities, athletes, influencers – and almost anyone with interesting content can get million of followers through channels likeYoutube – resulting in a saturated communication landscape. This makes it increasingly challenging to cut through the noise and capture mindshare of target groups – for anyone that has a message to share. What’s more, cluster organisations have limited means to spend on marketing, so resources need to be used smartly. Viable marketing tactics for cluster organisations include content marketing, focusing on sharing relevant, useful content from cluster members in for example social media, and inbound marketing. The latter is a close cousin of content marketing, aiming at drawing attention to for example your website and generate leads through sharing relevant content. Last but not least, use creative events and campaigns that catch the attention of target groups. A great inspiring example is the Polar Bear Pitching taking place in Oulu, Finland, every winter.